1954 Jul 15 - McArthur, Mrs. D.F. 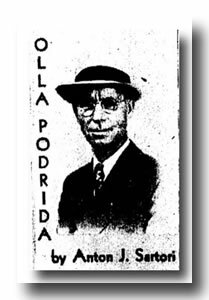 One of the most popular and long-standing features in The Globe-Post is “Olla Podrida,” a unique column conducted by Anton J. Sartori, former LeMars druggist, and a banker at Los Angeles, California. Olla Podrida is almost always in strong (but nice) opposition to The Globe-Post's editorial policy. Tony Sartori is a New Deal Democrat. He thinks Franklin D. Roosevelt was the greatest President. And anything he writes is PRINTED. Tony's the absolute and unquestioned boss of what goes into Olla Podrida. Tony has the rare ability of recalling nostalgic and pleasant scenes out of LeMars colorful past. He is a smooth writer, with a deftness and felicity of expression surpassed by none. Well, folks…here’s the newest thing in town—a column conducted by remote-control. If that isn’t new, what is? And don’t think I didn’t spar with the keyboard for what seemed like an age to get out that opening paragraph. But I made it, and if down to here will pass for a bow. I’ll speak my piece, and give you, what I consider, a fairly plausible excuse for this column’s existence. It was this way. 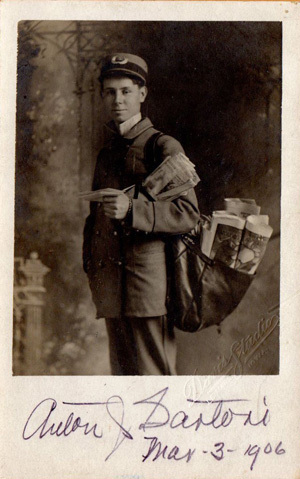 Somehow, somewhere, someone discovered that I was not opposed to the movement called the New Deal. That guy, they said, must be a freak. We’d better corral him. And they did. But it wasn’t as easy as all that, because they were a bit underhanded about it. First, they baited me; then they flattered me; then they dared me, and to cap it all, they double-dared me. And that’s the way this whole thing got started. I am not a politician. I have never held, nor do I aspire to office. In this venture I have nothing more at stake than the first five words of “America” and I have used them as the opening line of this article. I believe in working for the things that bring the greatest good to the greatest number. If this makes of me a New Dealer, then that’s what I am, and I’ll defend my position to the best of my ability. But I must be allowed off the reservation part of the time, much of the time, for I have no stomach for a steady diet of political pabulum. Olla Podrida: Spanish, n. 1) a spicy Spanish stew, 2) a hodgepodge; olio.